Jade explores the art world, interpreting the feeling an artist's work gives her, to distil into a piece of jewellery as a wearable homage. The strong blue and geometeric shapes in Henri Matisse's work are unmistakeable. The 2014 exhibition of the artist at Tate Modern brought together his cut outs, as he called it "Painting with Scissors" communicating through a collection of colour and shape. In this piece Jade has created a completely unique ring using fragments from her studio. Each coloured fleck was the resulting debris from pieces of jewellery she has made in the past and by gathering these it has allowed them to create their own kaleidoscopic jewel. This is a fragment of fragments she then built into a ring in brightest blue. "I thought of Matisse with all of these snippets of paper scattered around him, the discarded trimmings an exploded kaleidoscope as he artfully curved and corralled the scissors into making the shapes he wanted. This confetti was the negative of each of his shapes, you couldn't have made one without the other. Using the fragments of my own work, each one existing because of the pieces I had made has gone on to create a completely new piece, the offspring of creativity." 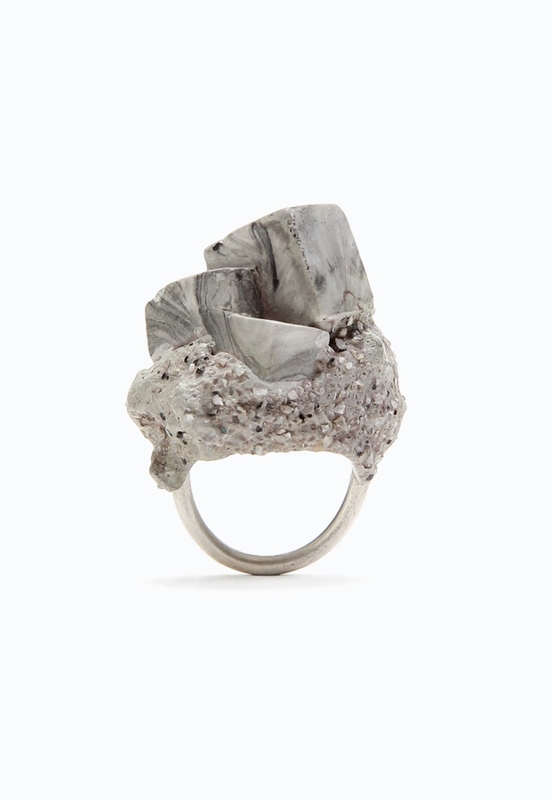 Jade Mellor, Concrete Objective, Ring, Resin, silver, granite. Every time I made my journey to my friends apartment I had to walk past the amazing sculpture by Eduardo Paolozzi. Seeing this beautiful beast outside Euston Station on each arrival reminded me of the creativity everywhere in London. There is so much art here to enjoy for free, London really is a home for culture. The way the angular shapes were formed in solid metal for this mountainous piece demonstrated how with determination and time you could create your own mark in even the most hardest materials to create something great and long lasting.